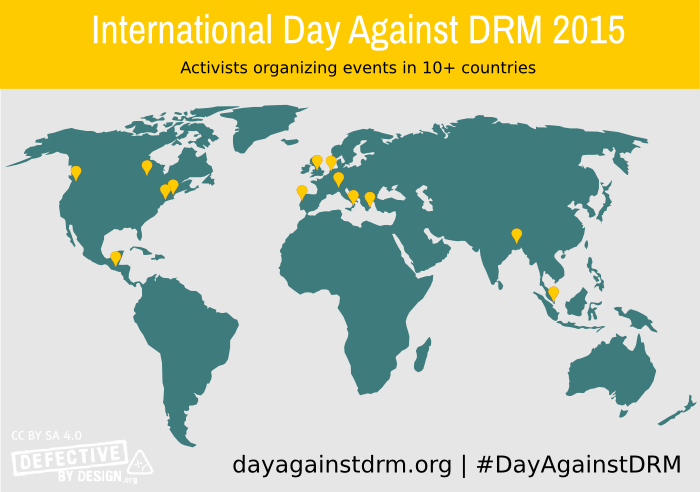 BOSTON, Massachusetts, USA -- Wednesday, May 6th, 2015 -- Today, a wide variety of community groups, activist organizations, and businesses are taking part in the ninth International Day Against DRM (dayagainstdrm.org). The groups are united in envisioning a world without Digital Restrictions Management (DRM), technology that places arbitrary restrictions on what people can do with digital media, often by spying on them. As the largest anti-DRM event in the world, the International Day Against DRM is an important counterpoint to the pro-DRM message broadcast by powerful media and software companies. The Day is coordinated by Defective by Design, the anti-DRM campaign of the Free Software Foundation. This year, community members are the highlight of the Day. Activists have organized twelve events in Bangladesh, Canada, England, Guatemala, Italy, the Netherlands, Portugal, the US, and Greece (as of May 5th). Events in at least nine countries. See dayagainstdrm.org for the most up-to-date list. Four individuals with unique perspectives also worked with Defective by Design to write community posts: two blind anti-DRM activists, an anti-DRM tech librarian, and a social scientist/activist analyzing the rise of DRM in streaming media services. Bookstores and publishers, including O'Reilly Media, are offering sales on DRM-free media and advocacy organizations allied with Defective by Design will also be making official statements. Activists in Russia, Romania, and France have already translated the anti-DRM flyer into their native languages, and more translations are in progress. More groups are expected to join on the day itself. Zak Rogoff, campaigns manager for the Free Software Foundation, said "Powerful entertainment and technology companies use DRM to restrict our use of digital media, demanding control over our computers and network connections in the process. Our community is doing everything we can to organize and build tools to protect our freedom. Our opponents are strong enough to have the government on their side in most countries, but when we come together, we are strong too." Individuals can participate with a variety of online and in-person actions on dayagainstdrm.org, from media downloads to gatherings. To be part of Defective by Design's year-round anti-DRM campaigns, supporters can join the low-volume Action Alerts email list or join the discussion on the email discussion list or #dbd IRC channel. Media stores, activist organizations and other groups interested in participating in the International Day Against DRM today or in 2016 should contact info@defectivebydesign.org. Defective by Design is the Free Software Foundation's campaign against Digital Restrictions Management (DRM). DRM is the practice of imposing technological restrictions that control what users can do with digital media, creating a good that is defective by design. DRM requires the use of proprietary software and is a major threat to computer user freedom. It often spies on users as well. The campaign, based at defectivebydesign.org, organizes anti-DRM activists for in-person and online actions, and challenges powerful media and technology interests promoting DRM. Supporters can donate to the campaign at https://crm.fsf.org/civicrm/contribute/transact?reset=1&id=40.